Can G&S Exclusive pull off this outrageous design? 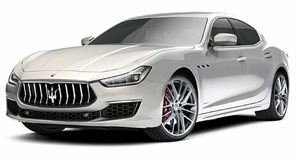 The Maserati Ghibli is a great-looking car, taking much of the Quattroporte's design elements and delivering them in a sleek, stylish and more compact package. With all the Italian design work behind this car, would you allow a bunch of Germans to apply cosmetic modifications to it? Not waiting for anybody's permission, G&S Exclusive has gone ahead and unveiled its updated version of the Ghibli, and we must say the result is quite striking. It involves loads of carbon fiber and a bunch of other goodies. For starters, the Ghibli featured here was given four massive 21-inch three-piece OZ lightweight wheels with 30 mm aluminum spacers. A carbon-fiber grille has been fitted to that car, along with a carbon fiber roof, fender strips, wing mirrors, door handles, rear spoiler lip and mirror surrounds. G&S also offers Ghibli owners bespoke side sills and a custom front splitter and spoiler lip, as well as a new rear diffuser and some lowering springs and coilover suspension. No performance upgrades have been detailed, but have the Germans done a decent job of styling-up this Italian model?